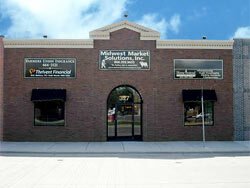 Midwest Market Solutions is the leading edge in commodity marketing and trading. Midwest Market Solutions was established in March of 2002 and is a full-service commodity brokerage and marketing advisory service, clearing through R.J. O’Brien. The firm specializes in individual trading strategies for the investor, personalized marketing programs for individual farm operations as well as full-service and discount broker services. The firm is located in Springfield, Missouri with branch offices in Yankton, South Dakota; Verona, North Dakota; Thief River Falls, Minnesota; Roseau, Minnesota; Omaha, Nebraska; Pocahontas, Iowa; Storm Lake, Iowa; Ennis, Montana and Watseka, Illinois. Midwest Market Solutions is committed to providing clients with the best information and service as possible. Midwest Market Solutions provides clients with written newsletters, trade research and hedging as well as trading advice.